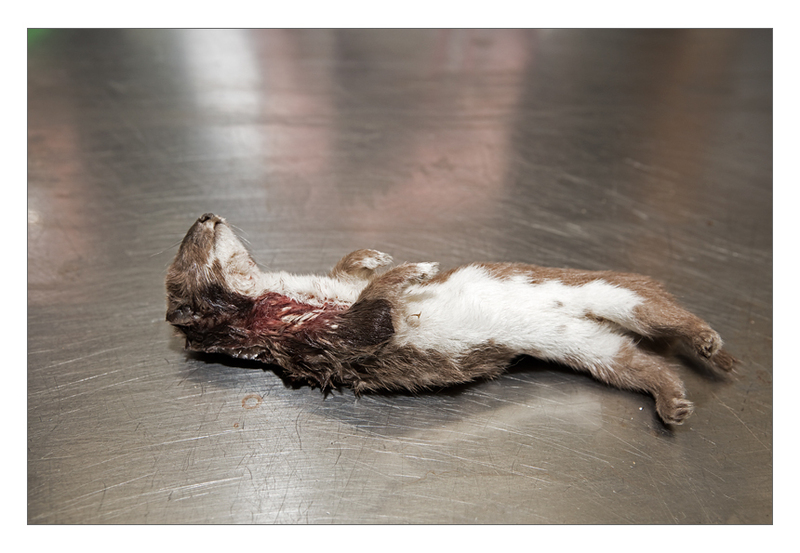 This weasel was caught by a cat, after which it was brought in for research. I have been dissecting Mustelid traffic victims since 2006. It all started when I wanted to do voluntary work as a student for the Dutch Pine marten working group. I just moved to Wageningen and heard that there were possibilities to help with research on road kill. 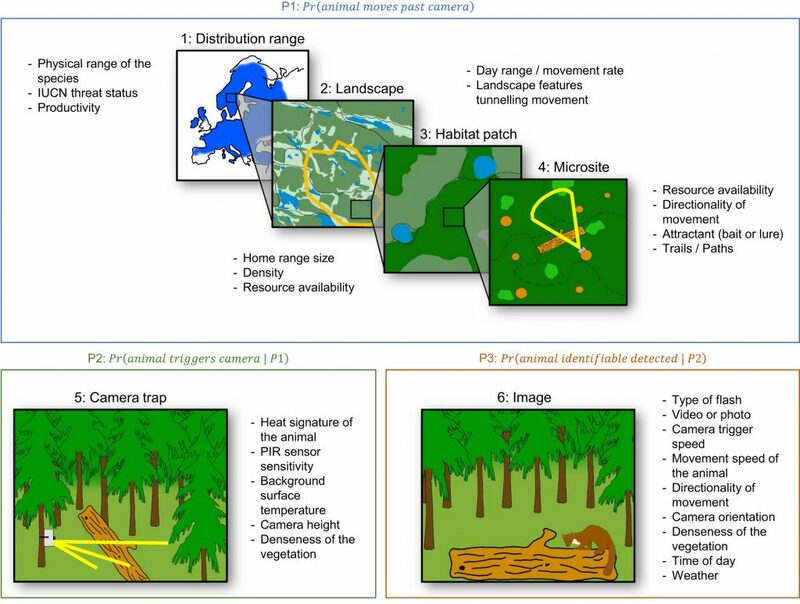 Soon I assisted Hugh Jansman and Sim Broekhuizen with their sections on pine martens. When I heard there were possibilities to help Jasja Dekker with sections on polecats, I started helping him as well, and by 2013 I took over the organisation of these sections. 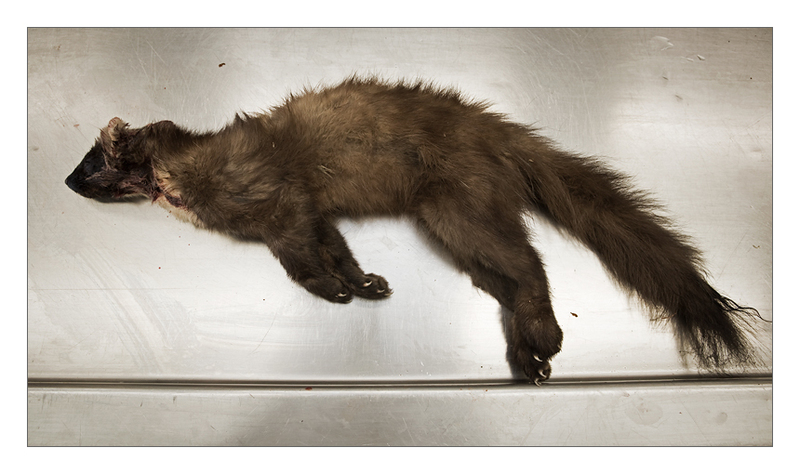 We study pine martens, stone martens, polecats, weasels and sometimes badgers, stoats and American mink. This month I organized the sections for the last time, as I don’t have that much spare time any more as I am in the last year of my PhD. The traffic victims we study are mostly brought in by volunteers who find them on the road. We always start with measuring the total length of the animal, and it’s weight. After that we use the wear of the teeth as a measure of ageing the animals and we check for clear signs of trauma on the outside. Recently, another external feature was added, and nowadays, I also check the animals for ectoparasites, about which I wrote a short post last year. 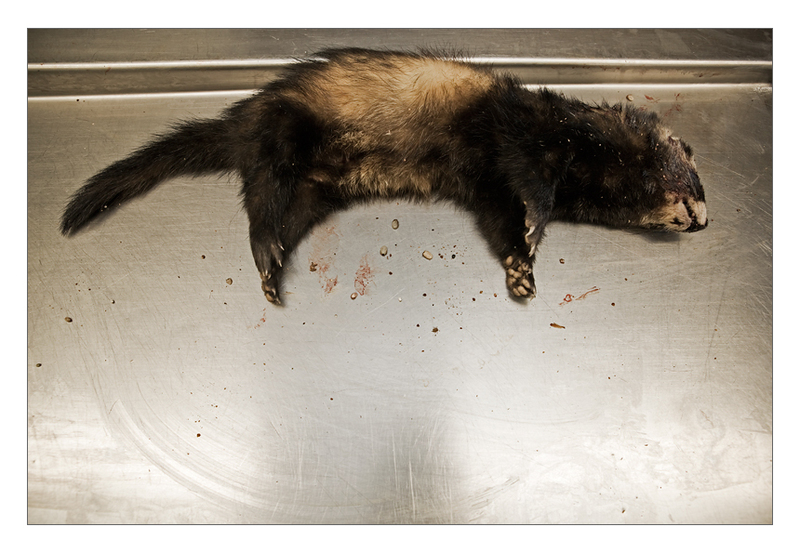 A male polecat which was parasitized heavily by Ixodes hexagonus ticks. After checking the animals from the outside, we cut them open to check and measure all kinds of things. We check for fat underneath the skin and around the kidneys, and weigh the fat stored in the mesentery to get an idea of the condition of the animal. We check for signs of reproduction, and we check for anomalies that could indicate the cause of death in case the animal was not found on a road. Doing this has taught me a lot about the biology of Mustelids, and it is a great way to get a close up look at these wonderful animals. 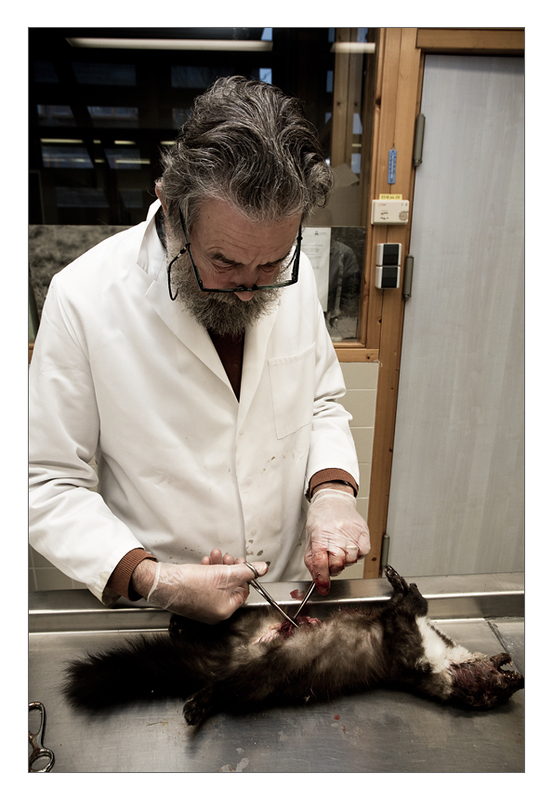 The author of a book on stone martens (Sim Broekhuizen) dissecting one of his favourite study animals (a stone marten). This year I will try to write a small story about one of my research related activities every month, and this month I will give a small account of the annual hibernating bat census. Every year many volunteers of the Dutch Mammal Society count bats in different places in the Netherlands. If I have time, I try to help Jasja Dekker with counting the bats around Wageningen. There are several different places we visit around Wageningen, namely, two old stone factories, an old ice cellar and several ruins of buildings. Bats hibernate in winter, most probably due to the low abundance of insects in winter, on which they feed. Some species hibernate all through winter, but some species become active during warmer periods to feed on winter active insects such as winter moths. During hibernation, the bats lower their heart rate and breathing in order to lower their body temperature and metabolism. In this way they can spend days hanging from their feet. Depending on the species they will hibernate in more enclosed or more open spaces varying in moisture level and temperature. Therefore, a good hibernation site for bats has a variety in hiding places at different temperatures and moisture levels, to facilitate a multitude of species. Today we started at the old stone factory near Rhenen in an area called ‘De Blauwe Kamer’. This stone factory was build around 1900 to fabricate bricks, but was discontinued in 1975. After that, some of the ruins were left, among which part of the big ring furnace. It is in this ring furnace that we count the bats. Although the space is quite large, it is difficult to look into all the cracks and crevices to find the hibernating bats. The ring furnace has openings to the outside, which means that there is a gradient in temperature and moisture level. We found several species of bat, namely the brown long-eared bat (Plecotus auritus), Daubenton’s bat (Myotis daubentonii), Natterer’s bat (Myotis nattereri) and whiskered bat (Myotis mystacinus). 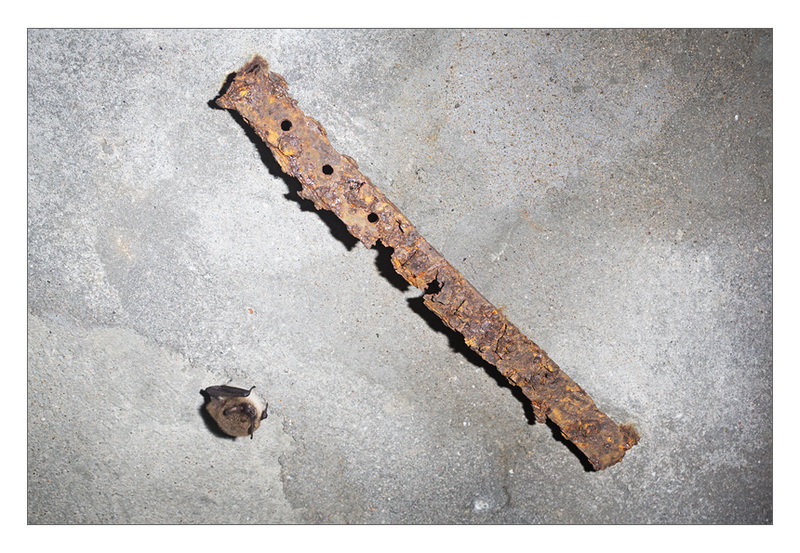 It can be quiet difficult to find the bats in the first place, as you have to look above your head in the dark while trying not to stumble over the rubble that has accumulated over the decades after the factory stopped working. Next to the stone factory ‘de Blauwe Kamer’, we visited several other sites among which the most notable are the old ice cellar at ‘Oranje Nassau Oord’ between Wageningen and Renkum and the old stone factory near Renkum. 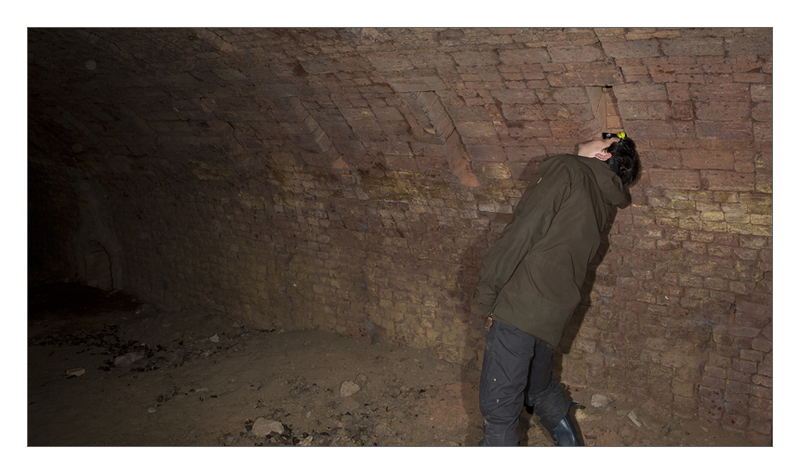 The old ice cellar is a fantastic site to look for bats, as the bats are hanging freely on the walls, which makes identification and finding them a lot easier, but which also makes this object more prone to disturbance, as the bats can’t hide away in between the bricks. Unfortunately, my flashes were not working properly at the moment we visited the cellar, so I don’t have any pictures from this site this year. After the cellar we went to several ruins of old buildings at a place called Buunderkamp. Depending on the weather you can find more or less bats here, as the sites are very exposed. Luckily, today was not that cold, so there were still some bats hanging from the ceilings, such as the whiskered bat at the top of this post. The old stone factory near Renkum is a similar object to the old stone factory ‘De Blauwe Kamer’, but the type of furnaces were different, which results in a lot of small tunnels instead of one large one. These small tunnels are not very suitable for photography, so no pictures from here either. 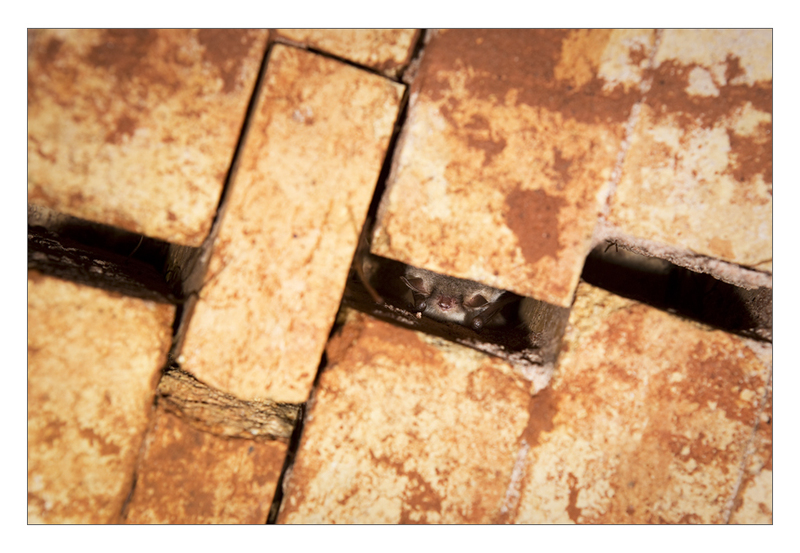 Hibernating Natterer’s bat (Myotis nattereri) in between the bricks in the old ring furnace of stone factory ‘De Blauwe Kamer’. Spring is in the air! Last weekend multiple records were broken, as the highest temperatures for this time of year were measured in the Netherlands. This also means that all of a sudden flowers are popping up everywhere, birds start singing and ticks are active again. Good for my research, but also great for photography. A winter without snow and ice is not very interesting for photography, so I am happy that spring has arrived. 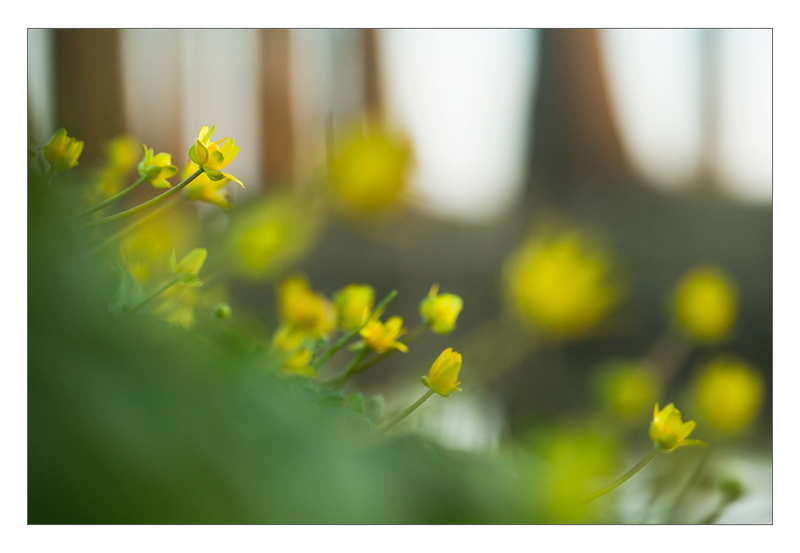 I found some Ficaria verna next to a ditch near my home, which gave me some ideas for photographs against the sun with reflections. Unforunately, a small dike next to the ditch blocked the setting sun, so there were no light reflections, which meant I had to try some other things. In the picture above, you see the last sunlight on the trees on the dike, some reflections of the sky in the ditch, and of course many of the flowers. In the picture below, you see some of the flowers in the blue light after sunset, changing the mood completely. Both pictures are taken with my Canon 5D mIII and Canon 100mm macro lens. 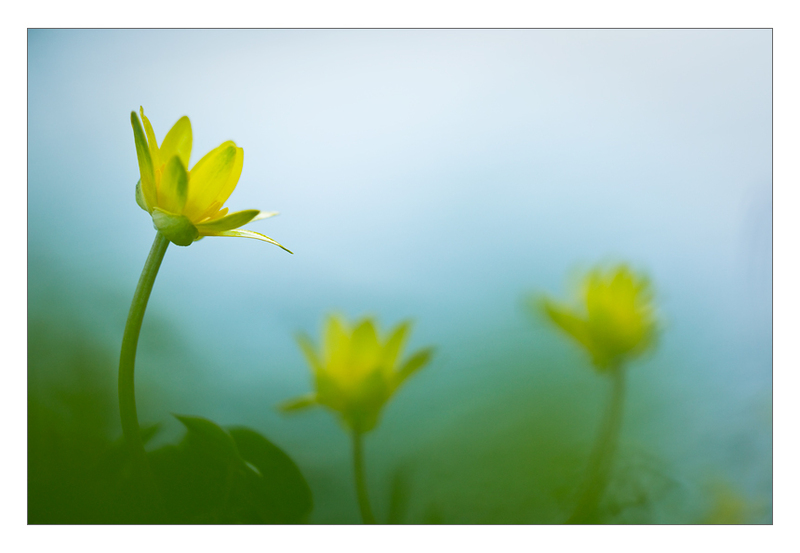 Posted on 10/03/2014 11/03/2014 Categories Photography, UncategorizedTags close-up, Ficaria verna, flower, Lesser celandine, macro, Photography, speenkruid, SpringLeave a comment on Spring! As I wrote in the text of my last Photo of the Month, I have been exploring new ground as a photographer on my last trip to Norway. 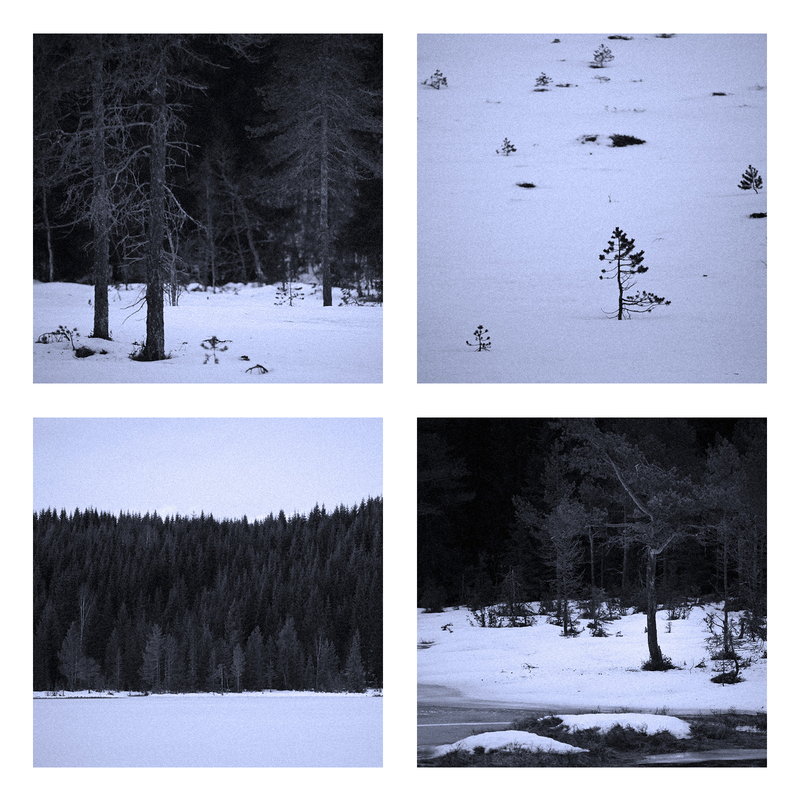 Inspired by the dark forest, the few hours of sunlight and the snow I made this little series of four photographs. It portraits for me the dark days of winter.